This game has been designed to help set the right culture in a group of people and help build mutual trust. It will empower all participants to act upon the results of this game. You write down the words “Meaningful” and “Pleasant” in the middle of a flip-chart or whiteboard. You aks everybody in the group to shout out what they believe is necessary to make sure this meeting or workshop will be meaningful and pleasant. 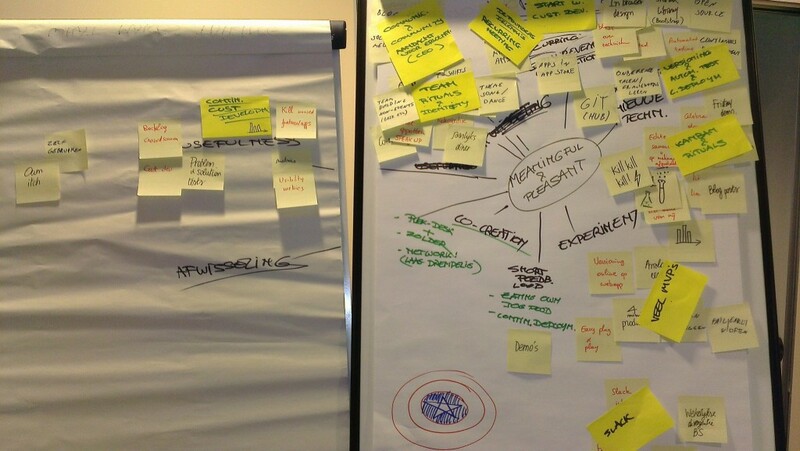 As participants are providing thoughts and ideas, you record the information given in a mind-map structure. Note: Preferably by using images instead of words. Quickly pass by each of the ideas recorded and make sure everybody has the same understanding of the idea at hand. If necessary adjust the item to avoid misunderstanding. = Values within the group. Now go back to the first item addressed and ask the participants how they believe would be a good way to make sure this idea is carried out during the meeting or workshop. Record the items attached to the given value addressed. = Actions. End the game with pointing out that this code of conduct that the group just created needs to be upheld by everyone. Every participant has the responsibility to make sure everybody in the group respects this code. = working agreement. Optionally: You could ask people if they want to take ownership of one of the actions registered. Note: Be aware that this may cause a typical human reaction from the others: “It is this persons problem to monitor, not mine anymore”. Make sure everybody contributes to the making of the mind-map. If you believe the group is not strong or comfortable enough for this, you could substitute the shouting of ideas by letting everyone write down their ideas in silence combined with an affinity map to achieve similar results that can be recorded in the mind-map. It will take some time to create this shared code of conduct but it will help groups of people where there is little to no trust and openness to break through the initial barriers. This post was originally authored by Jonan Tré and the source is unknown.